In the past couple of months, I have started to day dream about having a second child. Jack is nearly 20 months old and it’s a natural time to start considering having another baby. My friend Jess said that when your baby is about 15 months old you begin to forget how difficult and horrible the first year is. I think she is exactly right. I have started to see newborns and my heart melts as I consider the bond of nursing. Or how cute it is when they move around with their stiff arms and gassy smiles. Or baby burritos! 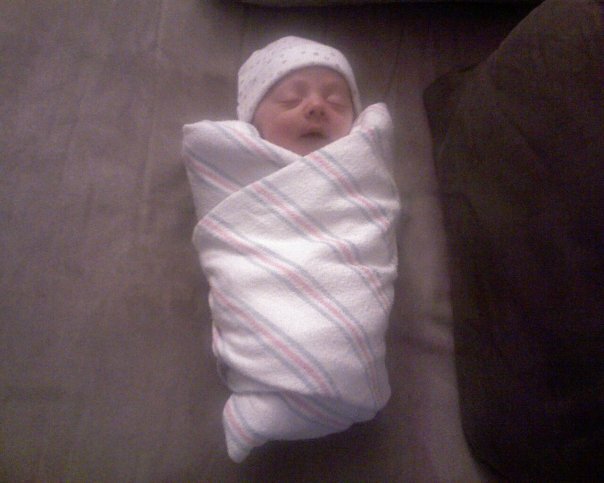 You can’t forget baby burritos! Then I read an article in Parent’s magazine about colic and I remembered. Instantly fear gripped my heart. I remembered rocking, bouncing, shushing, swaddling and sobbing as I tried to sooth Jack’s cries for hours every night for weeks and months on end. I remember being ready to quit. Ready to run away because my mind and soul could not take the torture any more. I remember feeling like it was my fault that he was such a fussy baby and that I was weak because I could not handle it. And I remember calling out for God’s comfort in the midst of such suffering and feeling like he wasn’t there. My prayers bounced off of the ceiling which suddenly felt so close and confining. I was trapped night after night doing the impossible: soothing a baby who would not be soothed. I remembered Jesus said, “I will never leave you nor forsake you”, but boy, if he was there, he was pretty quiet and detached because I did not sense his presence at all during that time. Then finally, finally, I was done. One morning in March, when Tim was still sleeping, I collapsed on our bed in tears, waking Tim up. “I can’t do it anymore. I just can’t.” Tim got up and went to Jack while I crawled under the covers to sleep. Suddenly, He was there. God was whispering into my ear, holding me, comforting me. I’m here for you. I’ve been here for you. Shhh. Shhh. It’s going to be ok.
And I knew. Deep in my being I knew that He had been there the whole time. My prayers had not actually bounced off of the ceiling, but were heard and I was cared for though I did not feel it. Many people say that God could no longer be in Jesus’ presence because sin had been placed on him and God could not bear to be in the presence of sin. Therefore God had in fact, turned from Jesus on the cross. This sort of makes sense, until you remember Jesus is God! How could God leave God?! It’s impossible! In the book The Shack, the main character Mack meets the Trinity in human form: Papa (aka God the Father), Jesus, and Sarayu (the Holy Spirit). Mack notices that not only does Jesus bear the scars from the cross, but they are on Papa’s wrists as well. The message: Papa was on the cross too. God the Father was with Jesus the whole time whether Jesus felt it or not. So when Jesus says “I will always be with you,” He will. He is. He is present. We just need to open ourselves up to receive his presence. (inhale) Jesus (exhale) I need you. Knowing that He is present, that I don’t need to fear his absence, makes the idea of another baby much easier. I am praying the next one isn’t colicky. I’m praying I don’t get PPD again. But even if one or both of those things happen again, I’ll be ok. He got me through the first one, he can get me through the next. A second child is currently one of my greatest fears. My heart starts beating quickly and I begin to panic just thinking about it. While nothing went “wrong” for me with Lydia, it is just plain exhausting to have a newborn, and I feel like it has taken me this long to feel like I am in balance and in a routine that makes me feel a little more like myself. I’m glad I’m not the only one! Oh, I think there are more of us out there than would like to admit. It took me a long time to feel like I had things under “control” (that word to be used very lightly). When I started my job at Scum of the Earth Church, all sense of balance was thrown out the window. Now I am more settled in a new routine and I’m very aware of how a newborn would disrupt it. I’m just thankful I haven’t had a surprise pregnancy thus far!